As a grower, you put a lot of time, effort, and resources into growing the best plants that you possibly can - and you also take pride in seeing them thrive after they leave your care. But it's often tough times ahead for your trees, shrubs and perennials. They can spend months in a garden centre, or end up in very tough municipal street planting site where they will receive little or no aftercare. They are also subject to increasingly unpredictable weather and are often planted in disrupted soil environments depleted of the beneficial soil microbes that plants need to thrive. All of these outcomes can have a harsh impact on the success of the plant you've carefully cultivated. With the Natural Advantage™ that Root Rescue™ Transplanter MS-CS provides, you can help ensure that your plants are best set-up to succeed (wherever they end up) and save input costs as you grow them and ready them for your clients. Root Rescue's Transplanter MS-CS is packed with 18 different species of beneficial mycorrhizae which form a natural symbiosis with the roots of the host plant. The mycorrhizal partnership helps plants to form an incredibly dense and efficient network of root fibres; thereby allowing the host plant to find nutrients and water inaccessible to roots alone. 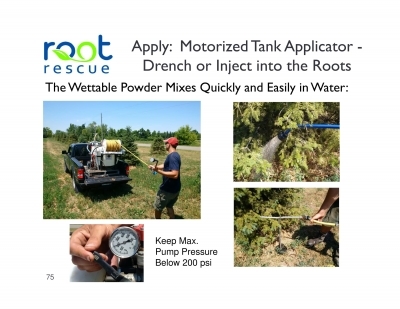 Root Rescue™ Transplanter MS-CS is not a synthetic fertilizer or a chemical: it is made entirely of natural organic elements and organisms native to the soils of Canada's wild, undisturbed forests, meadows, and prairies. There is no filler in Transplanter - the hyper-concentrated content of the package is entirely beneficial to plants. Using Transplanter MS-CS increases the ability of roots to access soil water, allowing for a reduction in both the frequency and duration of irrigation cycles. And your plants acquire greater stress tolerance in drought conditions. Mycorrhizal symbiosis increases access to nutrients previously applied (fertilizers) or to mineral nutrients already present in the soil. Mycorrhizal hyphae covert nutrient assets in soil into plant-available forms, and then transport them to the root. As a result, the application of fertilizers (particularly in field growing operations) can also be reduced in frequency and concentration. Applied nutrients (fertilizers) simply go farther, saving you money, and reducing the likelihood of nutrient runoff into irrigation ponds or waterways. Furthermore, unlike synthetic fertilizers, which last only weeks and require multiple applications, the beneficial effects of mycorrhizal symbiosis are permanent. The bond formed between the beneficial fungi in Transplanter MS-CS and the roots of your plants can last indefinitely. This will help to reduce transplant shock when you harvest your trees; resulting in fewer loses for you - and improved success for your clients. 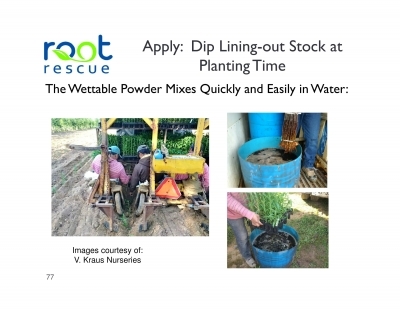 Root Rescue's Transplanter MS-CS is a highly concentrated wettable Powder which can be applied to your crops at various stages of production, or during the lining-out process. Easily mixed in water, the active ingredients remain in suspension for at least 5 minutes before beginning to precipitate. Gentle agitation (manual or mechanical) is all that is required to keep the solution homogeneous. High-volume, recirculating, tank applicators are ideal for the efficient application of the solution as a drench. The equipment's in-line screens should allow for the passage of particles 212 microns or smaller (No. 70 Screen). Transplanter MS-CS can be injected into the root zone of newly planted (or previously planted) trees, shrubs or evergreens with a root feeder probe. 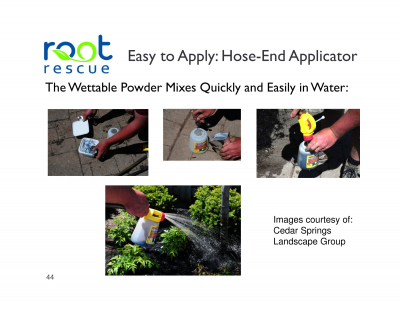 Generously apply the solution in a wide band at the drip-line, and drench the surface soil too. Transplanter is not a synthetic product - the solution cannot be over-applied - and will never burn roots. 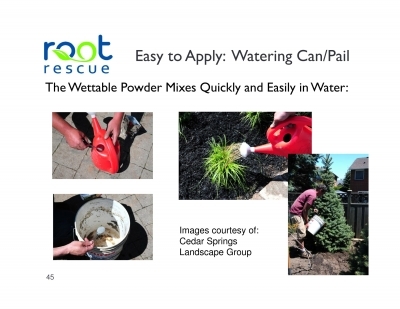 Once the target soil is saturated, any runoff will simply benefit nearby plants or turf. Apply anytime that the roots are active: spring, summer or fall. When using a low-volume, high-pressure root feeder - keep the maximum pressure below 200 psi.